history in the '87 drive. quela: A Woman of Israel,"
Team Leaders Lee Rauch and Elaine Cohn at the helm ..
in a close race with Rep.
tion at thia year's tax rates. come earned by the fond. yon and/or your spouse for life. heartfelt generosity that they count on. news for the Miami Herald. pledge paid by December 31,1986 is still only half your pledge. capital gains without the minimum tax implications which might apply after 1986.
same pledge, paid after that deadline, will supply a tax benefit effect of only $3,850. paying your 1987 pledge by the same date. available to help Jews in need. FACT: DECEMBER 31, 1986, WILL BE HERE SOONER THAN YOU THINK. S. Kanev, Dr. Morris Moel. Blvd. FortLauderdale, will be closed Thanksgiving Day, Nov. 27. Kegular office hours will resume on Friday, Nov. 28.
degree that they are able to. tions in the Woodmont area. nounced in the near future. commitments before the end of the year. courage advance payments on future pledges. given as much as a dime. growth must come from others. ple who give too little. tribute or don't contribute more. how important our work is. hope that you will take action. dale, FL 33321 (305) 748-8400.
in approximately the last 10 years. Silberman takes exception. marries someone who had been Gentile at birth." portion of Jewish women are likely to marry within the faith." as Jews. They are also expected to have 70 percent more children. of Jews, no matter how high the intermarriage rate is." Published Weekly November through Asfll. Bl-Weekly balance ol year. Geller Coordinator, 8358 W Oakland Park Blvd.. Fort Lauderdale, FL 33321 Phone (3051 7488400 Mai. aliyah to Israel of Rumanian Jews. the spirit as well as the body,"
want them to feel that way." nian Jews, but has no illusions. 19 years behind a political barrier. we can maintain a Jewish spirit. Camp David Accords and the Egypt-Israel peace treaty is vital. what is called "the peace process." press Israel but not the Arab states to make concessions. from its North Sea fields. League s economic boycott of Israel. Israel. Then they can be part of the process. cent increase over the 1974 totals. chairman Allan Baer, as of Jan.
Fleischmann's.gives every meal a holiday flavor. Tel Aviv in an out of the way area. ing in a designer's shop in Paris. Ada is going to be one of "the"
blesses the Shabbat candles. Dr.
to the Soviets: Let our children go! Calls for Chef Boy-ar-dee Cheese Ravioli. edge with remaining broccoli. Serves 4 to 6.
wheat semolina for unsurpassed taste and texture. its, absolutely Kosher and Parve. So start a new tradition this Shabbos with Ronzoni." No pasta shapes up better. 350 for 15 to 20 minutes. Serve with heated sauce. Makes about 8 servings. paign chair, and Deborah F.
The Siebenberg'8 house and museum in the Jewish Quarter. English in one of the many schools in Jerusalem. Egypt, Israel and the U.S.
sites performing the shabbat in their nursery school. Alliance. sugar coated like some raisin brans. fice, SS56 N.E. 34th St., in Fort Lauderdale. Jewish Federation'8 progress $ t \ for 1986. "We came because we cared,"
ed Old City to the photographer's right. and pivotal roles played by Dr.
Buck; Estelle Feerst and Rose Herman. associated with the shoe industry. campaign, at 8 p.m. Sunday, Dec.
Am, 7205 Royal Palm Blvd., Margate. the past five years. "Shnay Vyse"
is due for a repeat run in January. and children of elementary age. our members want," she says. and owns two master's degrees. well the North American way. members who are not," she adds. is your love of history." Castros of Panama City, Panama. and a dinner-reception at the JCC. 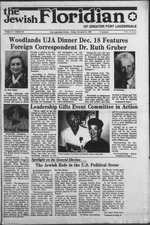 Jewish Life in Southern Florida." and half hours of "hands on"
The season has finally ended! Mutual in a very close game. ting, Stu Tatz and Jim Phillips. daughter of Mr. and Mrs. Jeffrey Bauman. Cora Jamal, daughter of Mr.
the lulav and the etrog. Book Month will take place Nov.
tional sponsor of tile Month. they gave me ideas for the poster. Four full-color 15" x 19"
$2.50 for postage and handling. American Jewry, and the U.S.
boys is AZA (Aleph Zadik Aleph). area for Jewiah girls aged 14-18.
the girls' component of BBYO. held on Sunday, Dec. 7.
tion to terrorism. "The time for pious declarations is long past,"
isolate and punish their sponsors." and narcotics control of activities abroad. stitutions that do not have drug programs. Order Your Holiday Pies Now! Prices Effective Nov. 20 thru 26.1986. Coastal Region: Trip on the S.S.
Allen and Rita and Ira Shore. Donation $5, $4. At Temple. and Joe Sodja. Donation $5. show. Tickets $25. At Temple. dale Lodge: 1-4 p.m. Meeting. Rec. Center, 4780 NW 22 Ct.
Belfer will perform two-act play. Shad Polier Chapter: 1-3 p.m.
ner and Show. $22 per person. and will continue until Dec. 31. Car Unit Ambulance for Israel. sion by the Supreme Court. ANDY STATMAN: ON RESPECTING YOUR HERITAGE AND YOUR BODY. is a gift from G-d. Therefore. vice at Ramat Shalom, Plantation. be celebrated on Saturday, Nov.
at Temple Kol Ami, Plantation. tain) of the Ark connote? cast a vote into the ballot box. ingside Heights in New York City. not a fool according to his folly"
ted in the late 1970s. Island Ave., N.W., Washington, DC. 20036.
ed the talks and the head of Israel's National Coal Supply Corp.
has been to Warsaw to meet with Polish officials. established Jerusalem as the seat of government. TAMARAC JEWISH CENTER (721-7660), 9101 NW 57th St, Tamarac. 33321.
day 8:45 a.m. RabM Kart F. Steae. 5 p.m.; Sunday 8 a.m., 5 p.m. RabM Paal Plotkia. RabM Emeritae, Dr. "
Saturday 8:46 a.m., 7:45 p.m. RaaM Haward A. Addiaaa. Caatar Maariea A. Naa. Blvd., Deerfiald Beach, 83441. Sarrieaa: Sunday through Friday 8:30 a.m., 6 p.m.
TEMPLE B'NAI MOSHE (942-6380), 1484 SE 3rd St.. Pompano Beach, 33060. Sarrieaa: Friday 8 p.m. Caatar Jakadab HeUbraaa. TEMPLE SHA'ABAT TZEDEK 741-0296), 4099 Pine Island Rd., Sunrise, 88821.
day 8:46 a-m., 6 p.m. RabM Randall Koaigsburg. Caator Jack Marcaaat. 8:46 a.m. RakM Israel Helpers. p.m., Saturday at 8:46 a.m. Charles B. Frier, Preaideat (722-7607). TEMPLE OHEL B'NAI RAPHAEL (788-7684), 4861 W. Oakland Park Blvd..
8 a.m.. 5 p.m.. Saturday 8:46 a.m., 6 p.m.
Deerfield Beach, 33441. Serricee: Sunday through Friday 8 a.m. and sundown. Saturday 8:46 a.m. and sundown. Jsssph M. Reiner, Preaideat. Stirling Rd., Fort Lauderdale, 38312. Serricee: Monday through Friday 7:30 a.m..
CONGREGATION M1DGAL DAVID 726-3683), 8676 W. McNab Rd., Tamarac. bi Caaim Schneider. Coagrsgatiea prsaidsst: Hsnaan Fleischer. vices: Friday 8 p.m.; Saturday 10 a.m. Rabbi Mark W. Gross. Menorah Chapels, 2806 W. Hillsboro Blvd.. Deerfield Beach. 83441, Friday 8 p.m.
RabM Nathan H. Fish. Caator Morris Liriaaea. Bat Mitxvah. Rabbi Jeffrey Ballon. Cantor Rite Snore. Creek Parkway. RabM Brace S. Waranal. Caator Barbara Roberts. evenings at S p.m. RakM Lewis littssan. \ Zionism. Conor Cruise O'Brien. I ween his homeland and Israel. from what might be achieved. other side, not even "moderate"
Woodcrest Club in Syoaset, N.Y.
viding the source in the notes. serves as general chairman for Bonds in Deerfield Beach. To sin or not to sin. "A good one, or a bad." to Menorah .where your last choice Is your best choice. ing the next two years.